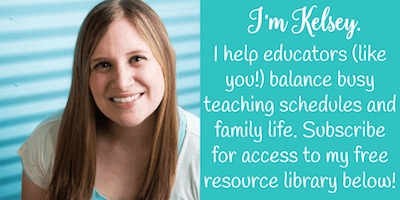 Finding the balance between full-time teacher and full-time mom can be tough. Sometimes, maintaining balance means leaving the classroom full-time. 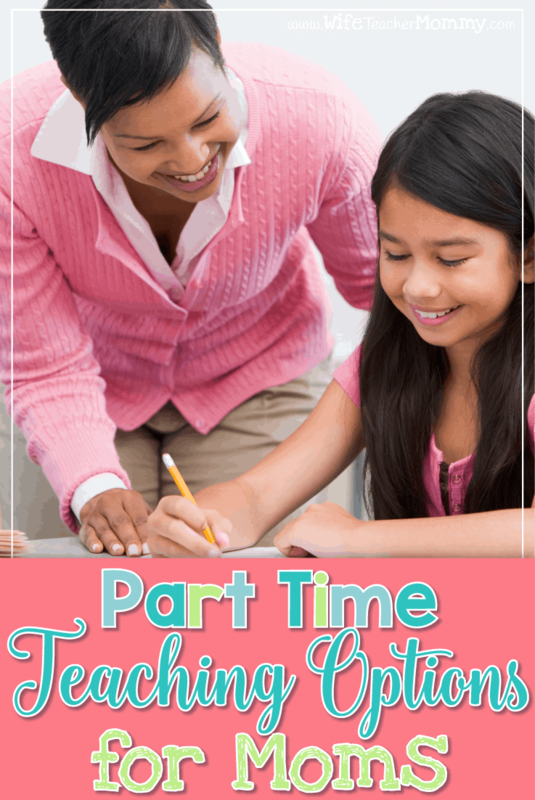 Unfortunately, there are not a lot of part-time classroom teaching jobs. However, there are many non-traditional part-time teaching options for moms that still allow you to work with kids and/or education professionals without putting in well beyond a 40-hour work week with hours spent in the classroom, meetings, and grading. Here are a few ideas to keep the cash flow coming but spend time at home with your kids. Stay in the classroom as a substitute teacher. Working as a sub allows you the flexibility to work whenever you choose. Have a field trip at your child’s school? No worries. You don’t have to take a sub job that day. Taking a family vacation? There’s no one to call to take the day off, no plans to write, no sick days to take. You get to make your own schedule. If you live in a larger city or area with multiple school districts, you may want to apply to multiple districts to substitute teach. This will give you greater variety and allow you to work as much as you’d like since there will constantly be jobs. 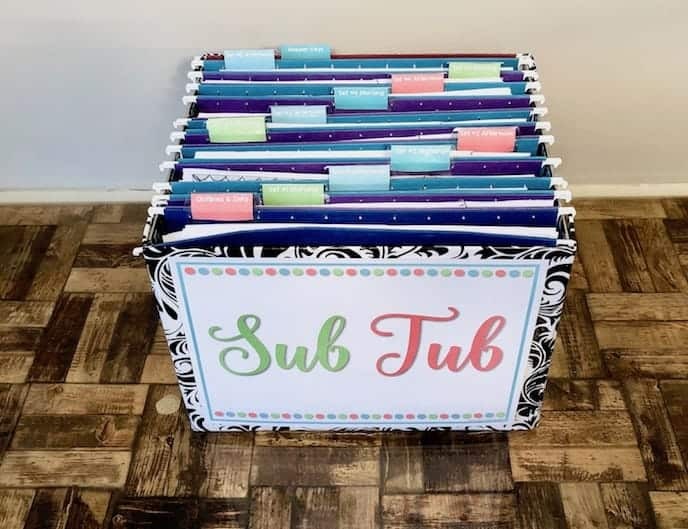 One benefit of subbing is the variety of curriculums, grade levels, schools, students, and teachers you’ll encounter. Every day will be different when you are a guest teacher! 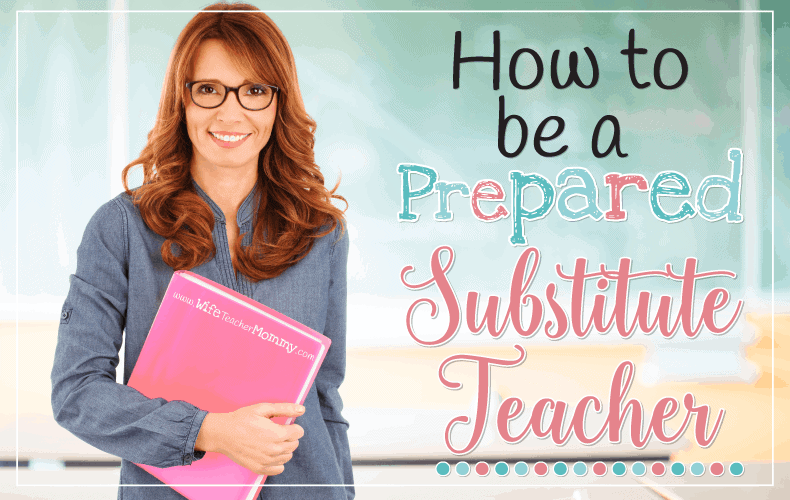 If you find yourself interested in subbing, you may be interested in my post about how to be a prepared substitute teacher. VIPKID is an online platform where you will provide one on one instruction for English Language Learners in China. This is not your ordinary online tutoring. In fact, applicants must have a Bachelor’s degree and go through an interview process. Teachers typically make anywhere from $14-22 to teach the provided curriculum materials to one student. Expect to work a minimum of 7.5 hours per week, but you can certainly book more classes. Many full-time teachers transition to paraprofessional positions in order to allow more time with their families. 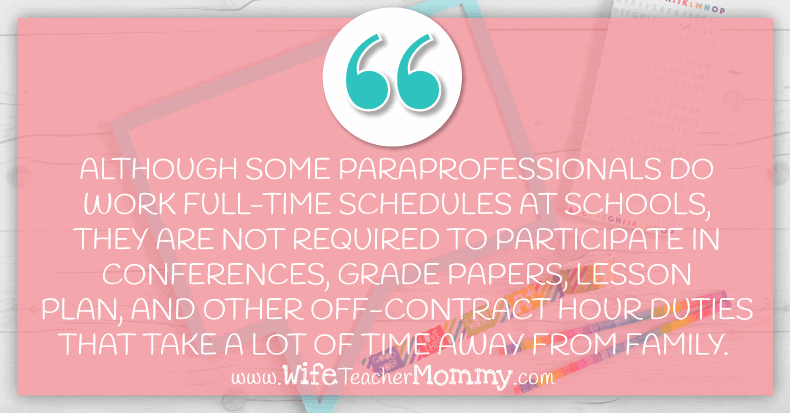 Although some paraprofessionals do work full-time schedules at schools, they are not required to participate in conferences, grade papers, lesson plan, and other off-contract hour duties that take a lot of time away from family. Sometimes there are part-time options available, too! Duties range from working with students with special needs, assisting with office or secretarial duties, and more. Maybe your school district or building allows for two teachers to share the duties of one full-time teacher. Although these positions are rare, you may want to ask if there are some part-time job share positions available in your district. Being able to stay in the classroom and spend time at home with your family may be the perfect job for you! Ask your teacher friends or post online and become an after school tutor. Parents are always looking for certified teachers to help their children with specific content or study skills. During teacher contract hours, students may have sport practices or simply be in need of longer tutoring sessions than the school can provide. 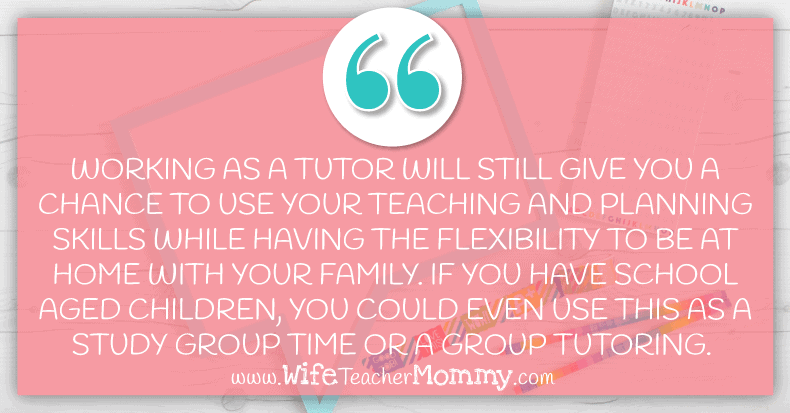 Working as a tutor will still give you a chance to use your teaching and planning skills while having the flexibility to be at home with your family. If you have school-aged children, you could even use this as a study group time or a group tutoring. Sell products on Teachers Pay Teachers. All those amazing ideas and gorgeous lessons you have swimming in your head don’t have to sit idle after you leave the classroom. 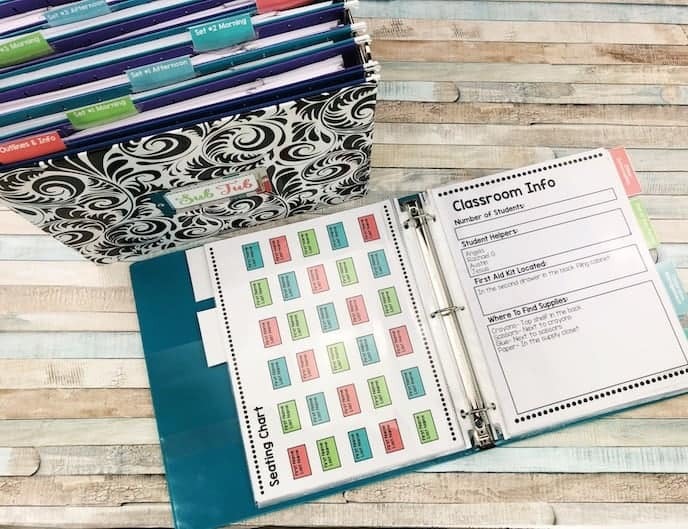 Selling lessons, printables, and presentations on Teachers Pay Teachers is an excellent way to earn a little extra money on the side. While selling on TpT requires a lot of work and patience to get started, it is a great opportunity to share your ideas. Whether you’re thinking about leaving the classroom altogether or changing your approach to teaching to spend more time with your family, these part-time teaching options for moms will help you earn income while focusing on your number one job, being a parent to your kids at home.